The Republican results are now the exact reverse of the earliest polls I saw of this race. Haley leads at 31.3, Andre Bauer is in second at 20.7, Gresham Barrett follows at 14.1, and Henry McMaster now occupies fourth place at 13.8 (MoE 3.8). I would love to start seeing some Haley/Bauer polls for the runoff, but of course in a four way race there’s no way to be sure they’ll stay ahead, so nobody in a position to commission such a poll is going to yet. The Democrats only have a three way race, but it’s even harder to tell who will be in the runoff. Vincent Sheheen has a decent lead at 26.3, but behind him Jim Rex at 17.2 and Robert Ford at 12.4 both would seem capable of making the runoff. 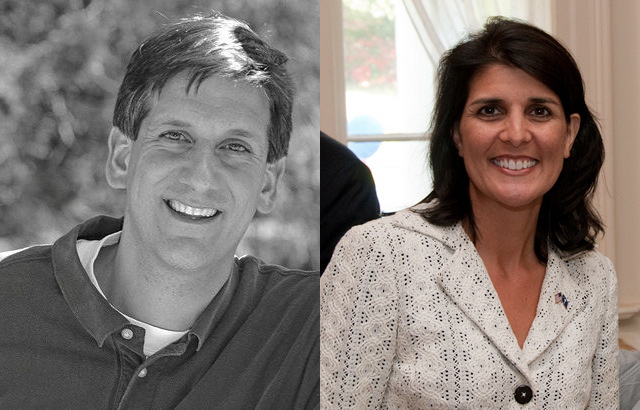 So in theory, Nikki Haley and Vincent Sheheen are the frontrunners for the general, but with two votes to go before we even know the general election matchup, we have some waiting to do. I have been a Haley supporter but what is the latest on the “supposed” scandal? How will that benefit the democrat Sheheen? I suspect voters will eventually dismiss it if no evidence comes up, and Haley will do well in a general election matchup.